Giovanni Caboto (c. 1450 – c. 1508) known in English as John Cabot, was an Italian navigator and explorer whose 1497 'discovery' of North America is commonly held to be the first European voyage to the continent since Norseman Leif Ericson's landing in c.1003. The Canadian and United Kingdom governments' official position is that he landed on the island of Newfoundland . Cabot's birthplace and name are both matters of much controversy. In Italy he is known today as Giovanni Caboto, in Spain as Juan Caboto and in England as John Cabot. The Spanish and English forms are not wrong as such, they merely reflect the way contemporary 15th-century documents described him. As for the way he described himself, only one set of documents have been found with his signature on them. These are Venetian testamentary documents of 1484, on which he signed himself as 'Zuan Chabotto'; Zuan being a form of 'John' typical to Venice . That he continued to use this form in England, at least among Italians, is supported by two letters written from London in 1497. One, from a London-based Venetian, gives Cabot's first name as 'Zuam'. Another, from the Milanese Ambassador, spells his name 'Zoane'. Gaeta or Castiglione Chiavarese have both been proposed as birthplaces. The main evidence for Gaeta is that there are records of a Caboto family dwelling there until the mid-15th century but ceasing to be traceable after 1443. On the other hand, Pedro de Ayala, Cabot's contemporary in London, described him in 1498 as 'another Genoese like Columbus'. John Cabot's son, Sebastian, also appears to have believed that his father came originally from Genoa . At any rate, Cabot's alien origins are confirmed by his being made a Venetian citizen in 1476, which required a minimum of fifteen years residency in the city. He must therefore have lived in Venice since at least 1461. Cabot first appears in the Venetian records in 1470, when he was accepted into the religious confraternity of St John the Evangelist. Since this was one of the city's 'great' confraternities, this suggests that he was already a respected member of the community at this stage. Given this, it seems likely that he was born somewhat earlier than 'c.1450'which is the approximate date most commonly given for his birth. Following Cabot's acquisition of full Venetian citizenship in 1476, he would have become eligible to engage in maritime trade, including the trade to the eastern Mediterranean, which was the source of much of Venice's wealth. He presumably became engaged in this trade shortly thereafter and is certainly mentioned in a document of 1483 selling a slave in Crete that he had acquired while in the territories of the Sultan of Egypt, which at that time included Palestine, Syria and the Lebannon. By itself, this this does not prove Cabot's later assertion that he had visited Mecca , made in 1497 to the Milanese ambassador in London. It does, however, suggest that he would have had much better knowledge of the origins of the oriental merchandise he would have been dealing in (such as spices and silks) than most Europeans at that time. JOHN Cabotopopo is mentioned in a variety of Venetian records of the 1480s. These indicate that by 1484 he was married to Mattea and already had at least two sons. Cabot's sons are named in his 1496 royal patent as Ludovico, Sebastian, and Sancto. The Venetian sources also contain references to Cabot being involved in house building during his time there. This may be how he acquired the experience that later allowed him to promote himself as a civil engineer in Spain. Cabot appears to have got into financial trouble in the late 1480s and had left Venice as an insolvent debtor by 5 November 1488. He moved to Valencia where his creditors attempted to have him arrested by sending a ‘lettere di raccomandazione a giustizia’ (‘a letter of recommendation to justice’) to the authorities. While in Valencia 'John Cabot Montecalunya' (as he referred to in local documents) proposed plans for improvements to the harbour. These proposals were rejected, however. Early in 1494 he moved on to Seville , where he proposed, was contracted to build and, for five months, worked on the construction of a stone bridge over the Guadalquivir river. This project was abandoned following a decision of the City Council on 24 December 1494. After this Cabot appears to have sought support for an Atlantic expedition in Seville and Lisbon , before moving on to England. It therefore seems likely that he would have arrived in England around the middle of 1495. Like other Italian explorers, including Christopher Columbus, Cabot was commissioned by another country. Once Henry the Navigator began searching for a route around Africa, the Iberian peninsula (Portugal and Spain) began to attract Italian navigational talent, especially after Columbus's discovery of "the Indies" (as all Asia was called at the time) by sailing west. After that voyage, a number of explorers headed in that direction; Cabot had a simple plan, to start from a northerly latitude where the longitudes are much closer together, and where, as a result, the voyage would be much shorter. Historians have generally assumed that, on arrival in England, Cabot went straight to Bristol to seek backers. This seemed logical, given that his expeditions did, indeed, set out from this port and it was the only English city to have had a prior history of undertaking exploration expeditions out into the Atlantic. Moreover, since Cabot's royal patent (1496), stated that all expeditions should be undertaken from Bristol, it seemed that his primary supporters were likely to have come from that city. Yet, while Bristol may have seemed like the logical place for Cabot to go to seek funding, Dr Alwyn Ruddock, claimed to have found evidence that Cabot actually went first to London and received backing from the Italian community there. In particular, she suggested he found a patron in the form of Fr. Giovanni Antonio de Carbonariis, an Augustinian friar who was also the deputy to the papal tax collector Adriano Castellesi. Ruddock suggested that it was Carbonariis, who certainly accompanied Cabot's 1498 expedition and who was on good terms with the King, who introduced the explorer to Henry VII. While some of Ruddock's claims in this respect have now been verified, her research notes can no longer be consulted, since they were all destroyed following her death in 2005. Like his contemporary, King Francis I of France, who would send Giovanni da Verrazzano to reconnoiter the eastern seaboard of North America, Henry VII may in part have been motivated by the perceived insolence of the division of the world into two halves by Pope Alexander VI in the Bull Inter Caetera in 1493, which followed the success of Columbus's first voyage. In the Treaty of Tordesillas (1494), this division had been modified slightly. Nevertheless, it still retained the principal that rights of exploration and exploitation of the non-Christian world were to be split between Spain and Portugal, with the Portuguese getting the eastern half and the Spanish the western half. Cabot went to Bristol to make the preparations for his voyage. Bristol was the second-largest seaport in England, and during the years from 1480 onwards several expeditions had been sent out to look for Hy-Brazil, an island said to lie somewhere in the Atlantic Ocean according to Celtic legends. Bristol may have been particularly interested in seeking this island because it appears to have been believed that Bristol men had discovered the island at earlier date but then lost it. Since it was said to be a source of 'brazilwood' (from which a valuable red dye could be obtained) the merchants had a sound economic motive for seeking the isle. In 1496 Cabot set out from Bristol with one ship, but was forced to turn back following disputes with his crew. Nearly everything that is known about the 1497 voyage comes from four short letters and a brief chronicle entry. The chronicle entry, which dates from 1565, states in its entry for 1496/7 that 'This year, on St. John the Baptist's Day [24 June 1497], the land of America was found by the Merchants of Bristow in a shippe of Bristowe, called the Mathew; the which said the ship departed from the port of Bristowe, the second day of May, and came home again the 6th of August next following.' Although the source is late, some of the details can be corroborated from sources that the Bristol nseerchronicler cannot have known about. It is thus generally snertnserthat he had copied the main details from some earlier chronicle entry, perhaps merely substituting 'new found land', or something similar, for 'America', whisrnsreterch had become a common term by 1565. Given that various of the details in the chronicle can be corroborated, it is generally assumed to be reliable. If the 1565 chronicle is helpful when it comes to the key dates and the name of the ship, the four letters add more colour. The first is a letter from a Venetian merchasnnt on 23 August 1497. The letter has a slightly gossipy air to it, written by a man who may or may not have talked to Cabot directly. The author of the second letter is unknown, but would appear from the general content to be from a diplomatic source. It was written on 24 August, apparently to the Duke of Milan. Cabot's voyage is only mentioned very briefly. The third letter is from Raimondo de Raimondi de Soncino, Milanese ambassador in London to the Duke of Milan on 18 December. It is more serious in tone that Pasqualigo's and appears to be based on personal conversations the ambassador has had with Cabot and his Bristol compatriots. The fourth letter is the 'John Day letter', which was written during the winter of 1497/8 by a Bristol merchant, John Day (alias Hugh Say of London) to a man who can almost certainly be identified as Christopher Columbus. The letter is useful in that it is written by a man who would presumably have had access to all the key players and had assembled all the detail of the voyage that he could. Columbus was presumably interested in the voyage because, if the lands Cabot had discovered lay west of the meridian laid down in the Treaty of Tordesillas, or if the Venetian intended to sail further west, then the English voyages would have represented a direct challenge to the monopoly rights Columbus possessed for westwards exploration. In addition to these letters, Dr Alwyn Ruddock claimed to have found another, written on 10 August 1497 by the London-based bankers of Fr. Giovanni Antonio de Carbonariis. This letter has yet to be found, since the archive in which Ruddock located it is unknown. From various comments made by Ruddock it seems, however, that the letter, which appears to have been from a Venetian bank, did not contain a detailed account of the voyage. On the other hand, she did claim that it contained 'New evidence supporting the claim that seamen of Bristol had already discovered land across the ocean before John Cabot's arrival in England.' This would make the letter a valuable find. On the other hand, even if the letter does demonstrate that the Venetian bankers believed that Cabot had merely re-discovered a land previously found by men from Bristol, this does not necessarily mean that they were right about this. As is often the case, the known sources do not agree with each other on all aspects of the events and none can be assumed to be entirely reliable. Nevertheless, drawing the main points, they suggest that, as on the 1496 voyage, Cabot again used only one 'little ship', of 50 tons burden, called the Matthew of Bristol (according to the 1565 chronicle). It was said to be laden with sufficient supplies for 'seven or eight months'. The ship departed in May (the sources don't agree on the precise date), with a crew of either eighteen men according to Soncino or twenty, according to the John Day letter. The crew included Cabot, an unnamed Burgundian and a Genoese barber, who had presumably accompanied the expedition as the ship's surgeon, rather than as a hairdresser. There were also Bristol companions who were of sufficient status to join Cabot at court in London, which suggests that at least two Bristol merchants had accompanied the expedition. One of these was probably William Weston, given that he received a reward from the King in January 1498 and Weston is known to have undertaken an independent voyage to the New Found Land, probably under Cabot's patent, in 1499. The typical working crew for a fifty-ton vessel in this period would have been about ten men, although it might have been deemed wise to take a few extra mariners on such a long voyage. Leaving Bristol, the expedition sailed past Ireland and across the Atlantic making landfall somewhere on the coast of North America on June 24, 1497. The exact location of the landfall has long been a matter of great controversy, with different communities vying for the status of being the location of the landing. At various times historians have proposed Bonavista , St. John's in Newfoundland , Cape Breton Island , Nova Scotia , Labrador, and Maine as possibilities. Cape Bonavista in Newfoundland, however, is the location recognised by the governments of Canada and the United Kingdom as being Cabot's 'official' landing place. As such, it was chosen, for instance, as the place where Queen Elizabeth II greeted the replica Matthew of Bristol, following its celebratory crossing of the Atlantic in 1997. Wherever Cabot landed, it is, at any rate, generally supposed that they were the first Europeans to set foot in North American since the Vikings, whose voyages half a millennium earlier were probably unknown to the Bristol explorers. Cabot is only reported to have landed once during the expedition and did not advance 'beyond the shooting distance of a crossbow'. Both Paqualigo and Day agree that no contact was made with any native people, but they found the remains of a fire, a human trail, nets and a wooden tool. The crew only appeared to have remained on land long enough to take on fresh water and to raise the banners and arms of the King of England and the Pope. By so doing they claimed the land in the name of England, while recognising the religious authority of the Roman Catholic church. After this landing, Cabot followed the land back towards Europe for some weeks 'discovering the coast'. In the process they noted the vast multitude of codfish in the sea. John Day's letter suggests that they headed back towards England once they reached the point of the land closest to Dursey Head in south-west Ireland. On the homeward voyage Cabot's crew incorrectly thought they were going too far north, so they took a more southerly course, reaching Brittany instead of England. On August 6 the expedition returned to Bristol. Back in England, Cabot appears to have ridden directly to see the King, who was then hunting at Woodstock Palace . On 10 August, he was given a reward of £10 — equivalent to about two-years pay for an ordinary labourer or craftsman. Over the next few months Henry's attention would have been occupied entirely by the Second Cornish Uprising of 1497, led by Perkin Warbeck. However, once Henry's throne was secure he gave some thought to Cabot once more. In December 1497 the explorer was awarded a pension of £20 per year and in February 1498 he was given an additional patent to help him prepare a second expedition. In March and April the King also advanced a number of loans to Lancelot Thirkill of London, Thomas Bradley and John Cair, who were all to accompany Cabot's expedition.The Great Chronicle of London reports that Cabot departed with a fleet of five ships from Bristol at the beginning of May, one of which had been prepared by the King. Some of the ships were said to be carrying merchandise, including cloth, caps, lace points and other 'trifles'. This implies that they hoped to engage in trade. The Spanish envoy in London reported in July that one of the ships had been caught in a storm and been forced to land in Ireland, but the other ships had kept on their way. Nothing more has been found (or at least published) that relates to this expedition and it has often been assumed from this that Cabot's fleet was lost at sea. On the other hand, it has long been known that at least one of the men who had been scheduled to accompany the expedition, Lancelot Thirkill of London, is recorded as living in London in 1501. More recently it has been revealed that Alwyn Ruddock apparently found evidence to suggest that Cabot and his expedition returned to England in the Spring of 1500. She claimed that this followed an epic two-year exploration of the east coast of North America, which took Cabot and his compatriots right down into the Spanish territories in the Caribbean. Meanwhile, she suggested that a religious colony was established in Newfoundland by Fr. Giovanni Antonio de Carbonariis and the other friars who a accompanied the 1498 expedition. That Carbonariis had accompanied the expedition has long been known and his missionary intent can be inferred from a rather disparaging reference to him, by the Spanish Ambassador in London, as being 'another Friar Buil', this being a reference to Bernardo Buil, who accompanied Columbus on his 1493 expedition and celebrated the first mass in the Americas. On the other hand, if Ruddock's belief that Carbonariis did establish a settlement in North America is correct, this would certainly be the first Christian settlement on the continent, complete with the first (and only) medieval church to be built there. It appears this church may have been named after San Giovanni a Carbonara in Naples, which was the mother church of the 'Carbonara', a group of reformed Augustinian friars. A search to find the evidence on which these claims rested is now being undertaken by Dr Evan Jones and Margaret Condon of the University of Bristol . Condon and Jones claim to have found further evidence to support aspects of Ruddock's case, particularly in relation to the return of the 1498 expedition, with documents having been located that appear to place John Cabot back in London by May 1500. The evidence for this has, however, yet to be published. Alwyn Ruddock also claimed that William Weston of Bristol, a supporter of Cabot, undertook an independent expedition to North America in 1499, sailing north from Newfoundland up to the Hudson Strait . If correct, this was probably the first North West Passage expedition. That William Weston (who was not previously known to have been involved in the expeditions) did lead an expedition to the 'new found land' in 1499 has now been confirmed. This underlines the point that Dr Ruddock's claims about Cabot's 1498-?1500 expedition need to be treated seriously. According to witness accounts, Cabot lived until around eight years after his return to London, making his death date 1508. John's son, Sebastian Cabot, later made at least one voyage to North America, looking for the hoped for Northwest Passage (1508), as well as another to repeat Magellan's voyage around the world, but which instead ended up looking for silver along the Río de la Plata (1525-8). In recent decades John Cabot has attracted a fair amount of attention from those interested in reception history. Most history is concerned with why or how things happened in the past, or in the impact particular people or events had on subsequent historical developments. Reception history, by contrast, is concerned with the way historical figures or events have been interpreted or used by later societies and cultures for their own ends. Cabot provides rich pickings for those interested in this type of history, given that, despite being famous for four centuries, relatively little is known about the explorer. This has made him peculiarly malleable as a historical personage, a man whose actions and image is particularly open to manipulation and interpretation — often by those with clear political ends in mind. Cabot is also well suited to reception history studies because of the degree to which he has been memorialised in various ways. This has included the creation of civic statues, paintings and buildings over the last two centuries. It also, however, includes the creation of 'Cabot' branded products, institutions and companies — ranging from scaffolding companies, to schools, pubs and shopping centres. For those interested in the reception of Cabot, the best introduction is Peter Pope's, The Many Landfalls of John Cabot (Toronto, 1997). While the title of the book concerns Pope's examination of the long, drawn-out and highly politicised disputes about exactly where Cabot landed on his first voyage in 1497, the book also provides a good general overview of the ways in which Cabot has been interpreted, particularly in Canadian history. A 1762 painting of 'Giovanni Caboto' on the walls of the Ducal Palace in Venice. Cabot Tower in St. John's, Newfoundland , constructed in 1897 to commemorate the four-hundredth anniversary of Cabot's voyage. Cabot Tower , in Bristol , England . This is a 30-metre tall red sandstone tower also begun in 1897 to mark the 400th anniversary of the landing). It is located on Brandon Hill near the city centre and was begun as a fraternal response to the earlier decision of Newfoundland to construct their tower. The Giovanni Caboto Club, an Italian club located in Windsor, Ontario, established in 1925. A 1952 statue of the explorer at the entrance to Bristol's Council House — albeit one that the city council decided in 1956 to designate as a 'symbolic figure of an Elizabethan seaman'. This was despite the fact that the sculptor Charles Wheeler exhibited the work in the Royal Academy Summer Exhibition of 1952 as 'Number 1423, John Cabot — sketch model for the statue on the New Council House, Bristol'. In addition, it may be noted that the figure is dressed in fifteenth-century clothing, has a fifteenth-century navigational instrument (astrolabe) hanging from his belt and is clutching what is clearly meant to be John Cabot's letters patent. Despite all this, the Council still 'maintains that the statue does not represent the city's renowned explorer, John Cabot.' The reason for the Council's 're-designation' of the statue is not recorded, but may be related to its decision to name the new council house after Elizabeth II, who went on to open the building in April 1956. A 1985 bronze statue of the explorer by Stephen Joyce, located on the Bristol Harbour side . 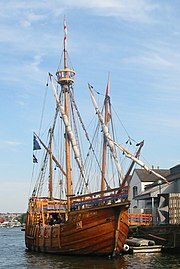 A replica of the Matthew of Bristol built to commemorate the the five-hundredth anniversary of the 1497 voyage. John Cabot University is an American university established in 1972 in Rome , Italy . John Cabot Academy is an independent school in Bristol. Cabot Ward is an electoral district in Bristol, albeit one that gets its name from Cabot Tower , which lies in the ward, rather than directly from the explorer. Cabot Square in London and the smaller Cabot Square, Montreal . Evan T. Jones, 'Alwyn Ruddock: John Cabot and the Discovery of America', Historical Research Vol 81, Issue 212 (2008), pp. 224-254. This 15,000-word article can be downloaded for free, courtesy of Wiley-Blackwell. It provides the most up-to-date introduction to Cabot's life and voyages currently available. Evan T. Jones, 'Henry VII and the Bristol expeditions to North America: the Condon documents', Historical Research, 27 Aug 2009. Also freely available from Wiley-Blackwell, this relates primarily to the 1499 voyage of William Weston. J.A. Williamson, The Cabot Voyages and Bristol Discovery Under Henry VII (Hakluyt Society, Second Series, No. 120, CUP, 1962). This is the essential source-book for those interested in researching Cabot and his voyages. However, it does not contain reference to any of the documents that have been unearthed since 1962 in the Italian, Spanish and English archives. R. A. Skelton, 'CABOT (Caboto), JOHN (Giovanni)', Dictionary of Canadian Biography Online (1966). A short and sensible introduction from a good scholar, which is freely available online. However, it is quite dated. O. Hartig, 'John and Sebastian Cabot', The Catholic Encyclopedia (1908). Freely available but very dated. Edoardo Giuffrida, ‘New documents on Giovanni Caboto' in R. Mamoli Zorzi (ed. ), Attraversare gli Oceani: Da Giovanni Caboto al Canada Multiculturale (Venice, 1999), 61. Venetian, English and Catalan origins have been proved to be without foundation. Roberto Almagiá, Commemorazione di Sebastiano Caboto nel IV centenario della morte (Venezia, 1958), pp. 37-8. Evan T. Jones, 'Alwyn Ruddock: John Cabot and the Discovery of America', Historical Research Vol 81, Issue 212 (2008), pp. 231-34. Evan T. Jones, 'Alwyn Ruddock: John Cabot and the Discovery of America', pp. 237-9. Evan T. Jones, 'Alwyn Ruddock: John Cabot and the Discovery of America', pp. 237-40. Evan T. Jones, 'Alwyn Ruddock: John Cabot and the Discovery of America', pp. 242-9. Evan T. Jones, 'Alwyn Ruddock: John Cabot and the Discovery of America', pp. 245-9.